A native tree, there is one growing near the Biological (DB23) Sciences walkway. 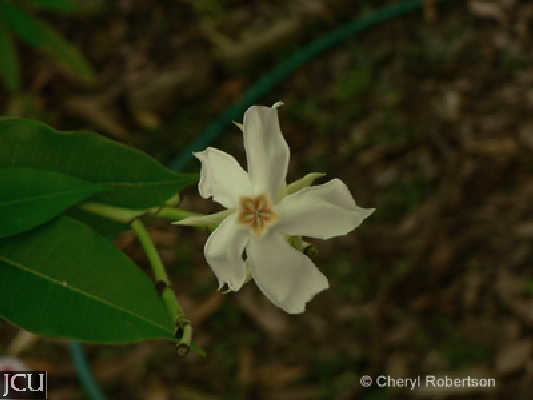 It has simple, leathery, glossy green leaves and tubular flowers with broadly spreading corolla lobes, petals white with a red centre. All parts contain latex. Only one of the pair of follicles often matures, rounded about 8 cm long and 8 cm wide, with a well-defined line on one side. Infusions have been used as a fish poison. Some flowers appear to be present most of the year.